One of THE great British bands, The House of Love return with a live document. It has to be said that The House of Love paved the way for so many bands from the 1990s to the present day. They were arguably the first stars on the much revered Creation label. At the heart of the band were softly spoken singer / guitarist Guy Chadwick and lead guitarist Terry Bickers, who became something of a legend. Chadwick and Bickers crafted many a fine tune between them. In the late 80s and early 90s the band released timeless singles and some fine albums. By 1992, they had released my favourite House of Love album (Babe Rainbow) without Bickers, who had departed only to return with Levitation, themselves a much praised outfit. Churning out pop classics, filled with heart felt lyrics and catchy guitar riffs, The House of Love were widely loved and adored yet somehow were never as big as some of their contemporaries. Surprisingly, Bickers and Chadwick reunited and reformed The House of Love to yet more critical acclaim. Live at the Lexington, a cd and dvd release recorded in London last year in front of an expectant crowd is rammed with songs you should know and love. Opening with Destroy The Heart with its instant hook, it is almost Buzzcockian in style and the listener should immediately fall in love with them again within the opening ten seconds. Hope follows after that explosive burst of an opener. Despite being released nearly a quarter of a century ago, it still sounds as fresh as ever. In fact if anything, it is better than the originally recorded version. The twin guitars and vocals from Guy and Terry sounding truly magnificent. The crowd clearly love it. Christine surpasses that and sounds so fresh, almost as if it was written only yesterday. Each and every song is greeted with cheers from the crowd. It is not all poptastic tunes though. There are some gentle and reflective numbers, She Paints Words in Red being one of those highlights. The Beatles and The Stones is yet another timeless classic. 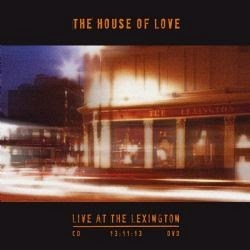 For those too young to know and appreciate The House of Love then Live at the Lexington is an excellent introduction. For long term fans, this is an essential purchase. The House Of Love are on Facebook. The album can be ordered directly from Cherry Red.